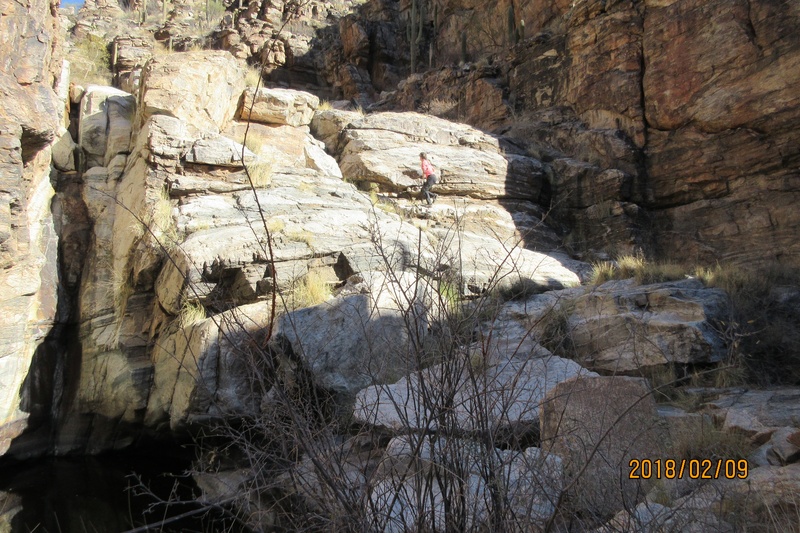 This is a pretty and fun loop, with scrambling on the way up one canyon and then again down the other canyon. 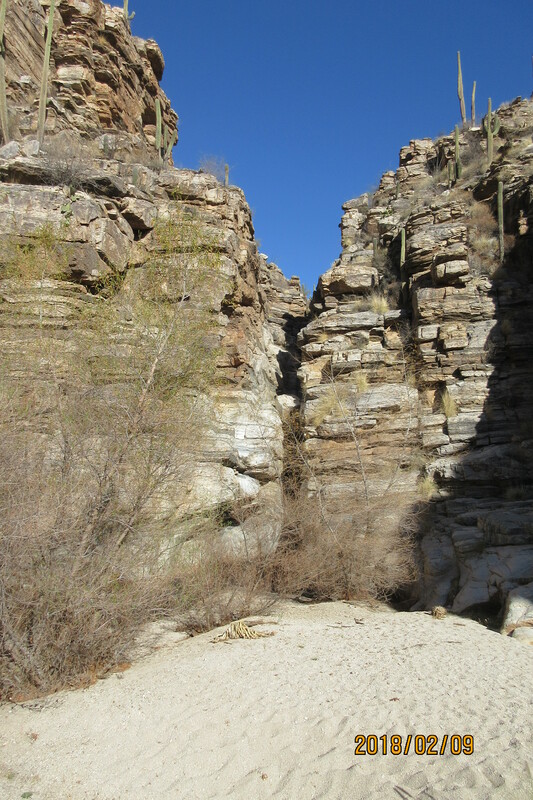 You can do the loop either way but clockwise seems to be the most common way to do it – up La Milagrosa Canyon and down Agua Caliente Canyon. The only downside is that there is less scrambling than one would like. 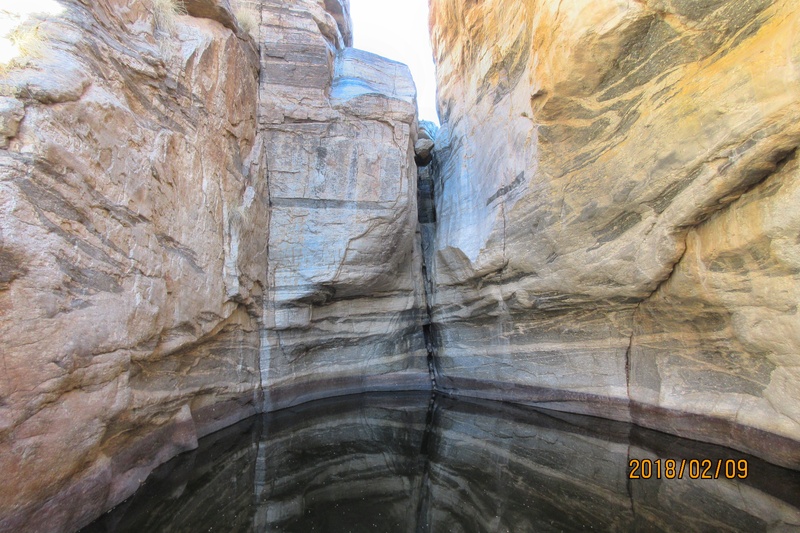 I did the loop on 2/9/2018 when there was very little water in the canyons, just in a few big pools. The photos in the pages I link to below show a lot more water. There is a fair amount of class 3 scrambling, and also some class 4, although much of the class 4 can be avoided by finding alternative routes. It just depends on what level of difficulty you enjoy. From the intersection of Catalina Highway and Tanque Verde, drive up the Catalina Highway to the second 4-way stop at Snyder Road. Turn right and drive for 1 mile to the 4-way stop at Soldier Trail. From the Soldier Trail intersection, drive 0.4 miles further east along Snyder then turn left on N. Avenida de Suzenu. Follow this for 0.3 miles until it deadends at Horsehead Road. Park on the right just before Horsehead Road. Just past Wentworth Road there’s a gate and on the other side a jeep road leads up the hill. Follow the jeep road up the hill and down the other side. As it curves round to the left you’ll pass under an old abandoned stone cottage. Just past the stone cottage the trail splits. The left-hand trail is the La Milagrosa Ridge Trail which is quite popular as a mountain bike trail. Ignore the left-hand trail though, and continue down the main jeep road to the canyon bottom. As you look left up the canyon, you’ll see a blocky rock with canyons on both sides. 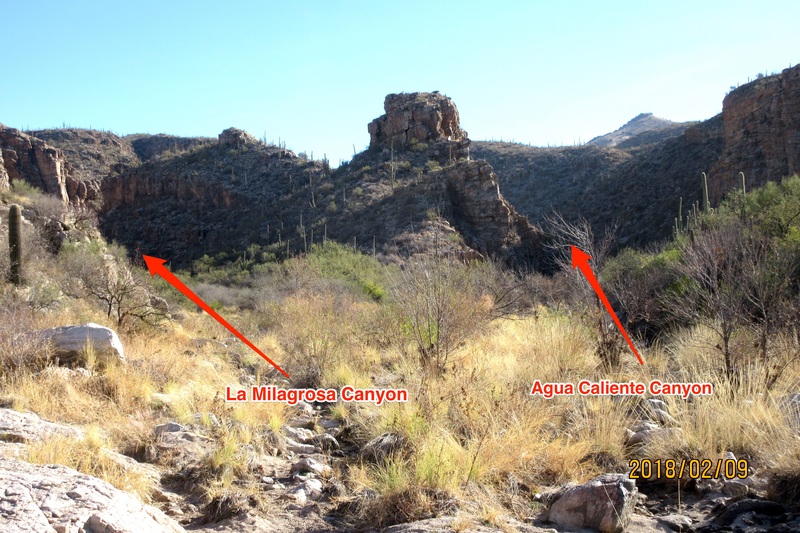 La Milagrosa Canyon goes up the left side and Agua Caliente Canyon up the right side (see top photo). Walk up the canyon bottom and pass the blocky rock on the left. Head up past the steep cliffs, a popular rock climbing area. If you look closely you may see slings hanging from the blank walls. You will have to navigate through huge boulders, with plenty of class 3 and some class 4 to keep you entertained. Eventually you will reach an obvious cleft with cliffs on both sides. You can bypass the cleft on either side, but the left side is the much better choice. It’s easier and you get wonderful views of the cleft and the pools above it. After traversing the shelf above the first cleft, you’ll need to climb again to avoid the next pool and cleft. Just climb high enough to traverse on more shelves above the big pool. You can climb higher but then you’ll need to descend after you’ve passed these beautiful rocks, pools, and clefts. But either way works. 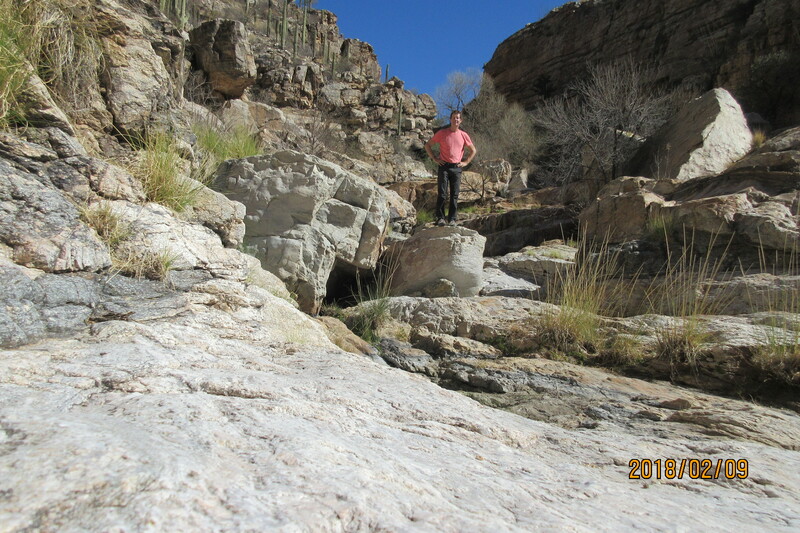 After this wonderful rocky section the canyon flattens and becomes much easier. Continue up until shortly before the canyon turns to the right, the La Milagrosa Ridge Trail crosses the canyon and you have a decision to make. So, up and up, until the Ridge trail turns sharp left and steepens. At this point there’s a trail that heads off to the right, towards Agua Caliente Canyon. Turn right and follow this trail as it contours then descends into the canyon. Once in the canyon bottom, start walking downstream. Eventually you’ll reach huge boulders and cliffs with a big drop to the pond below. Bypass this on the left, with one exposed move, then descend to the canyon floor again. Soon you’ll be faced with a second big drop. Bypass this one on the right by climbing up to a shelf and following this, then a faint path across the hillside and eventually down to the canyon bed. Take care to avoid the saguaro cactii that you will be passing very close to on the faint path 🌵😬 . Once down in the canyon bed again, the major difficulties are over. There’s still a fair distance to go, with plenty of scrambling, but there’s nothing above class 3 and it’s fun to pick your way through the rocks. A page about the loop with lots of beautiful pictures. Another page about the loop with lots of beautiful pictures. Yet another page about the loop.